Share the post "Album review: GREENSLADE (remastered and expanded)"
When Warner Brothers’ then-fledgling UK arm scored a hit debut with Curved Air’s ‘Airconditioning’ it was clear there was something in this new progressive rock music and the London office A&R scouts duly sallied forth to sign more British acts of that ilk. Step forward this 1972-minted combo, drawn from the ranks of demised jazz rock giants Colosseum and the more ‘experimental’ Samurai in keyboardists, came Daves Greenslade and Lawson, while bass duties fell to Tony Reeves, also ex-Colosseum, with former Fields’ stickman, Andrew McCulloch, on the drum stool. (No guitar; Greenslade says he didn’t want guitar). In the booklet accompanying this engaging digipak revision of their debut release from 1973, the Daves reflect on how their respective backgrounds in blues and jazz disabled any potential musical conflict, with Greenslade defining the overall outcome as not intended to be progressive. With Reeves and McCulloch up in the mix, the Daves jostle agreeably in the foreground of joint compositions loosely tackling environmental issues of the day in an agreeable stew of Hammonds, synths and Mellotron. The sound is dense, almost foreboding at times, the melody lines fluid, memorable and the balance between the slower-paced with brisker outings, fingers ablur over the keys and McCulloch splashing enjoyably about in the background, retains listener attention to the end. “Everyone was pulling together”, reflects Greenslade, and indeed the album has the polish, cohesion and drive of fellow time-travelers like Yes, with whom there are moments of stylistic overlap (including hiring Yes-fave designer Roger Dean to draw the cover art). 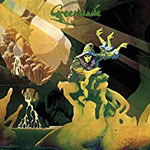 Greenslade (the band that is – it was all Dave’s idea so why not and they couldn’t agree on an alternative) also had a fitter’s grip on the small matter of rehearsal and the album measures label-friendly rigidity in getting it right when the quartet went into the studio in November 1972 to pretty much play it outright (a trick they were to pull off on their next release, ‘Bedside Manners Are Extra’). That discipline is also faceted in the bonus CD derived from two 1973 outings on BBC Radio 1′s Sounds Of The Seventies and In Concert series, the performances chiming with their studio counterparts yet retaining a distinct self of the moment, if not freshly-minted, at least rendered with a twist for the night. This entry was posted in ALBUM REVIEWS, ALBUM REVIEWS (Mobile), Reissues and tagged album, BBC, Dave Greenslade, Dave Lawson, Greenslade, prog, prog rock, Progressive Rock, radio, review, sessions, Tony Reeves. Bookmark the permalink.